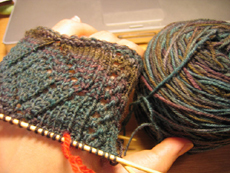 What’s on my knitting needles? I have a few things brewing in the back of my head, but only one thing actually on my needles. I like to work on one thing at a time, I think because I like to finish something before I start the next thing. I made a pair of socks for my grandmother back in October, and she loved them. They were sportweight with simple horseshoe cables, and came out great, if I do say so myself. 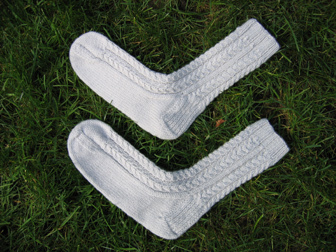 Grandma wore this pair of socks every day (my mom tells me), and they have pretty much disintegrated. So, granddaughter to the rescue! I’m making her another pair. 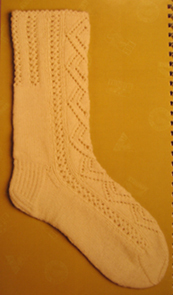 The pattern is from Knitting on the Road by Nancy Bush, called New England. The yarn I’m using is Lorna’s Laces Shepherd Sock. This yarn splits easily and is therefore a major PITA. But it makes a good-lookin’ sock, I tell you that! Here’s the wound ball of yarn and the beginnings of the first sock. 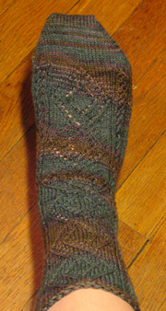 At this point I have finished the first sock, and have barely started the second. I want to be done soon so I can start the other projects in the back of my mind :).